Summary: It's nights like these that stay with you forever. Disclaimer: Mulder and Scully, though only implied and not implicitly mentioned, belong to CC and 10-13 as well as Fox Productions. Selfish, aren't they? This story is based on the song 'Summer Rain' by Belinda Carlisle and is copyrighted to MCA Records. It was on a night like this. The rain is thrumming on the ground, the lightning illuminating everything around me, the hot wind driving wet tendrils of my hair into my face. It's the middle of July and it's raining. It would be a nice respite from the heat wave that has plagued D.C. for the last two weeks, but it's a hot muggy rain, not the kind that brings relief. Most people are inside with their air conditioners on full blast, drinking ice cold beverages and hoping the power doesn't go out. Not me. I'm standing outside in the torrent, reveling in the warm splashes against my bare skin, feeling the soft earth beneath my feet. I breathe in deeply, the thick air smelling of clouds and freshly cut grass. For a moment I swear that I can smell your cologne being carried by the breeze and I close my eyes. It was on a night like this. You came to my apartment, breathing hard and looking as though you had run all the way from your place to mine. You probably did. You asked me if I wanted to go star gazing. I said that the weatherman predicted rain but you waved off my objection, claiming that just before a storm was the best time to see the stars. There was a look in your eyes that touched me deep inside and I found myself agreeing. We drove into Virginia, far out into the hills where there were no lights to obscure our view of the night sky. Laying a blanket out in the middle of a spacious field, we lay on our backs and stared into the heavens, silent except for the sounds of nature. When I finally looked down I discovered that you had been staring not at the stars above but at me. I raised an eyebrow, wordlessly asking for an explanation. You smiled softly and your eyes were dark with emotion. "You're beautiful," you murmured. At first I wasn't sure what to say or do but then I realized that you weren't expecting me to do or say anything. 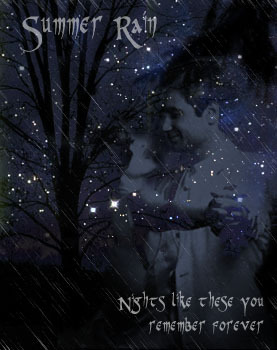 I smiled back and returned to my stargazing, the smile remaining. You lay back next to me, our shoulders touching and I felt electricity running through me from the point of contact. Your touch has always had that capability but something about that night made it harder to ignore. Eventually you broke the silence by whispering my name. I looked over, the question on my lips dying as soon as I saw your face. With nothing but the stars and moon casting light to see by, your face was a portrait of shadows and highlights. Within the chiaroscuro planes of your face two hazel eyes stared back at me, shining as though challenging the stars themselves. Dark hair slipping down your forehead, faint stubble gracing your chin, and your lips curving in a hint of a smile; you were breathtaking. We locked gazes for what seemed like hours, neither of us blinking until the echo of thunder rolled over the hills. You looked up at the sky, now clouded over with thick shades of gray and black, and the heavens opened up, sending warm rain coursing down to dampen the world below. Suddenly we were moving, you were pulling me to my feet and at first I thought that we were going to run back to the car for shelter. Instead you let go of my hands and raised your own skyward. You began turning around and around, your arms still reaching upwards, an enormous smile on your face growing larger with each revolution. I just stood and watched, my heart pounding as I witnessed your joy in life's simple graces. You slowly came to a stop, your chest heaving and eyes bright. You held out your hand to me and I took it, allowing you to pull me close. Then we were both turning in circles, our hands linked as we danced in the summer rain. Faster and faster we moved until I was too dizzy to think and then we tumbled to the ground, laughing as mud decorated our clothes. It was by accident that you landed on top of me and you would have moved instantly if our eyes had not met. But they did and it was in that moment that years of barriers disappeared as though the rain had washed them away. You lifted a hand to my cheek, caressing the damp skin with your thumb. "I love you," was all you said. I knew that you expected to be rebuffed or even ignored, but instead I return your caress, running my hand over your cheek to curl around your neck. Then, pulling you close, I captured your lips with mine. A kiss is nothing more than two people coming together physically, but when we kissed something else came together - our souls. You were gentle and understanding, making love to me with both your body and your heart. I felt like I had finally found a part of me that I was missing and hadn't been able to name until then. Afterwards, we lay on the grass, the sounds and smells of nature surrounding us, and we talked. As the rain poured down so our hearts poured out, expressing our fears, concerns, and feelings. We confessed our hidden desires and long concealed hopes, each listening to the other with a new understanding. You promised me that nothing would change in our working partnership, but outside of the office was a different matter. I believed you. We made love again beneath the weeping heavens, our souls becoming one as our bodies did. More impassioned that next time, your kisses were hotter than a Santa Ana wind as your lips trailed over my skin. The final release of the heat that had long been between us was enough to rival that of the night. I dropped you off in front of your apartment, as the next day we had to go to work and we both had things to do at our respective quarters. One last kiss, a whispered goodbye, and I returned to my car, starting the engine and waiting for you to enter the building. You stood there in the rain, staring after me and I could feel your love through the connection we had formed. You waved at me and then disappeared into the apartments. Pulling away from the curb I looked back in my mirror and saw that you had not gone inside but had instead come out to watch me. I'll never forget the sight of you standing on the walkway, your entire body glistening with raindrops and a beautiful expression on your face. It was the last time that I saw you, in the summer rain. There are so many questions left unanswered to this day. Did They kill you because you were getting too close to one of Their projects? Did They put a bullet in you because you had finally outlived your 'usefulness'? In moments of selfishness I think that maybe They did it because we had finally become more than just partners. But the question that has plagued me the most is, did you know you were going to die? Did you come to me that night with the knowledge that it was the last time we would ever be together? Is that why you finally crossed the invisible line between us? After almost a year of running over these questions again and again I have come to a conclusion. It doesn't matter. Because I don't regret what happened. I cherish the love we experienced that night under the stars and the rain. Our love was real and I relive those few hours on nights like this. Every time I see the lightning or hear the thunder, every time I close the window on a hot summer's eve, I can feel you close to me. I can feel you when the wind blows in my face and through my heart. Every day and night I dream of us together even though I know you've gone away. It doesn't matter what I do now, doesn't matter what I say; since that night somewhere in my heart I'm always dancing with you in the summer rain.